Download The Future of Facebook Advertising ebook now! Here are some facts, trends and statistics on video ads from North America, South America, Europe, Middle East, Africa and Asia. 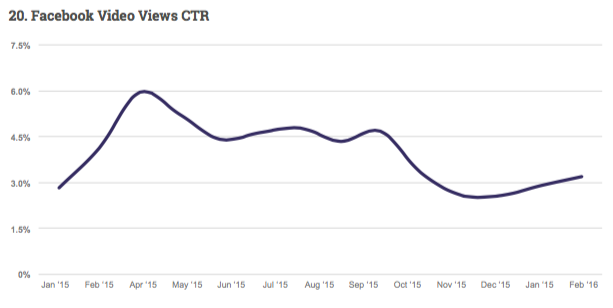 The CTR for Video Views on Facebook decreased by 13% from February 2015 to February 2016. 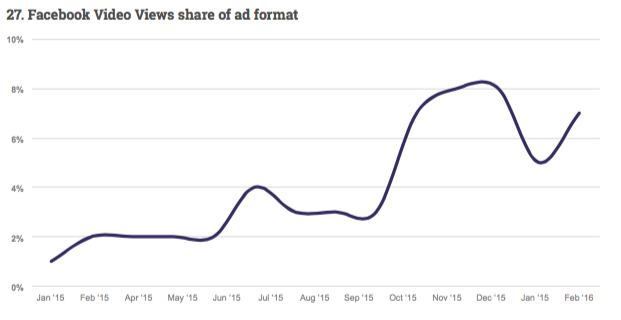 The CPC for Video Views on Facebook did not change from February 2015 to February 2016. Video ads increased dramatically in total ad distribution, from 1% of total ads to 11% in 2016. 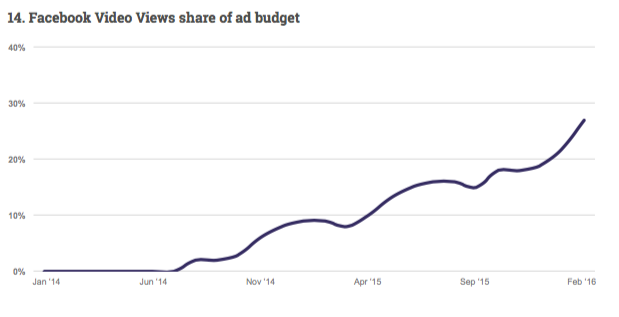 From 2015 to 2016, advertisers shifted budget to Video ads and away from page like and post engagement ads. The amount of total budget spent on Video ads increased by 200%. 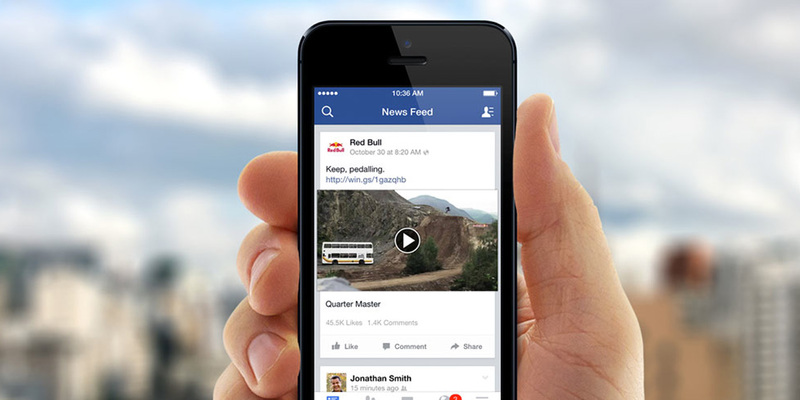 Video View ads make up 28% of advertisers’ budgets. CPC for Video ads increased by 60%, from $.05 to $.08. 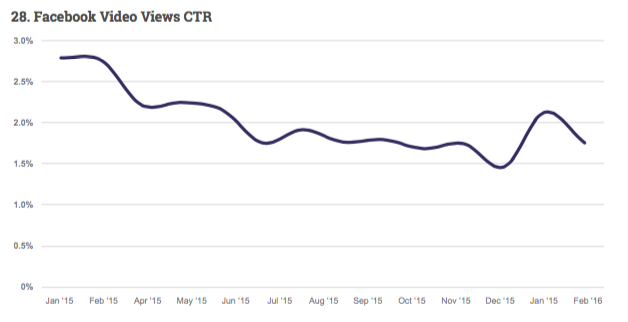 Video Views CTR decreased by 57%. 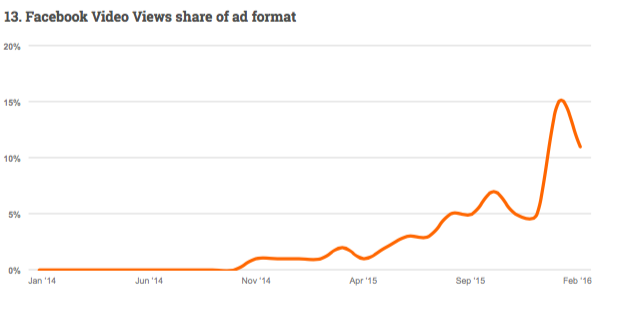 Video Views and website clicks, CPC has remained mostly steady over the last 12 months on other ad types. 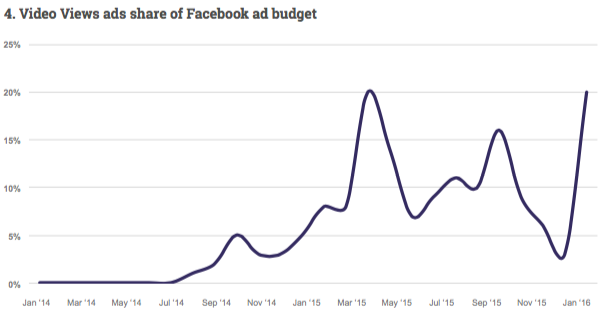 As of January 2016, they were 15% of all ads on Facebook, which was a 1400% year- on-year increase. Video ads are also a larger portion of marketers’ budgets, surpassing 25% of total budget in February 2016. We will see an increase in Video Views over the next year as people start using the budget they are increasingly allocating. in budget may have spiked an increase in competition, because CTR started decreasing. The top 3 ad formats people are spending the most on are Post Engagement ads (28% of budget), Video Views (27% of budget), and Website Clicks (21% of budget). There’s been a 250% increase in video ad campaigns year-on-year and video ad distribution has increased from just 1% of all Facebook ads to 8% over the last 14 months. 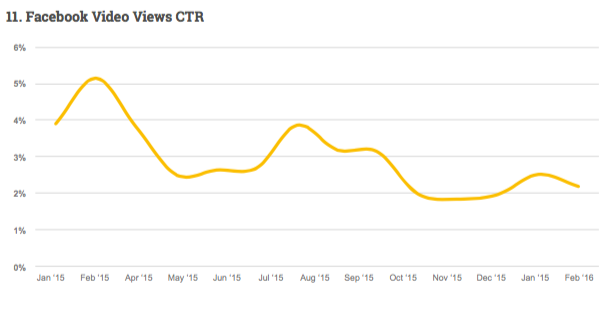 At the same time, CTR has decreased slightly, which is consistent with more advertisers using the ad unit. Now is the time to make use of video ads. Focus on grabbing your audience’s’ attention as they scroll through their News Feeds. At Vidian we can help you create compelling video ads, with no prior knowledge in video editing, in just a few minutes. Request a demo today! And stay ahead of the competition by learning how to enhance your advertising tactics and increase Click-through rate, taking your ad budget even further. Download The Future of Facebook Advertising ebook by Socialbakers and Hubspot.